New Orleans is a fantastic place to visit either on your own or with a group. This itinerary is for those short on time who want to experience a little of everything the city has to offer. Check out my general New Orleans overview and tips for solo travelers here. Start your day down by the French Quarter with a walk along the Mississippi River at Woldenberg Park. See the sculptures that line the walkway on one side, and the boats heading up or down river on the other. Wander up through the blocks of the French Quarter during the quieter daytime hours. Check out some of the voodoo and other shops on Royal Street. Walk over to either Acme Oyster House or Felix’s for lunch. New Orleans food is known form, amongst other things, their delicious oysters, and these are two of the more famous places to get them? If you’re like me and can’t stand the texture - don’t worry, their seafood menus offer plenty of other options! After lunch, take a streetcar named Desire… No, not really, but you want to hop on one of the St. Charles Line (#12) streetcars. They’re all named. It’s fun to take them up and down the line in general, but eventually get off at Washington and walk down to the Garden District. wander amongst the houses and see the cemetery. Rest up, as that evening you should take one of a multitude of ghost tours happening in the French Quarter. I loved Ghost City Adventures (with the amazing guide John) but there are so, so many. You’ll learn about much more than the city’s ghost stories. On my tour, we discussed piracy, Spanish and French occupations, the once commonplace ‘mulatto’ balls, voodoo queen Marie Laveau, and the best way to bribe a church official in 18th century New Orleans. We also learned about the proper way to drink absinthe and stopped at Lafitte’s Blacksmith shop, a bar set in one of the oldest structures in the city. The last two were due to being on a haunted pub crawl. After the tour, maybe you stay out drinking with your new ghost tour friends? End the evening with some sweets by getting delicious takeout beignets from the legendary Cafe du Monde in the French Quarter. There will be a line, but it should be short. In case you don’t know, beignets are small balls of fried dough with powdered sugar. The takeout bags come in packs of threes. It’s customary to get them with either coffee or hot chocolate, but not necessary. 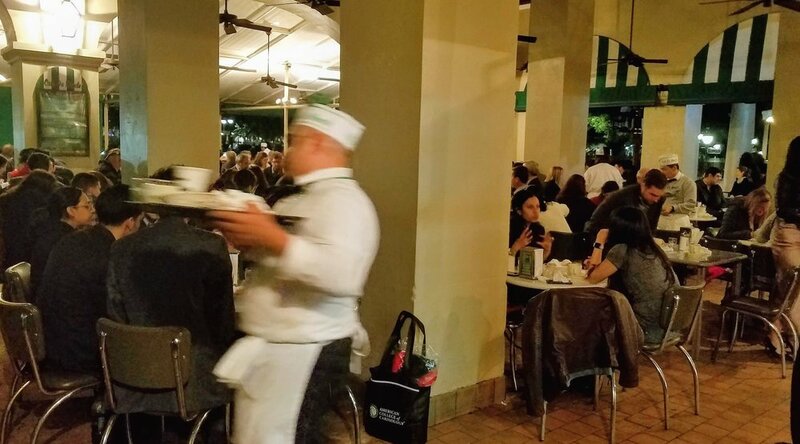 Beignets are a New Orleans staple and can be found at a number of locations, but Cafe du Monde is the most famous. No need for early rising, especially after your ghost tour last night (and any post-tour shenanigans). Grab some coffee and make your way over to Cake Cafe in the Marigny for a breakfast of boudin and eggs. What is boudin? Incredibly tasty cajun sausage, that’s what. After another rich New Orleans meal, it’s time to burn off some calories by taking a bike tour. It’s a great way to see some of the neighborhoods, streets, and sights outside of the French Quarter. Confederacy of Cruisers, Freewheelin, and Flambeaux all offer a variety of tours leaving at different times in the afternoon. If you’re up for something a little different, check out Ninth Ward Rebirth Bike Tours that takes you through the historic, but lower-income, neighborhood famously devastated by the flooding from Hurricane Katrina in 2005. Their 4-hour tours leave earlier in the morning, but offer a fascinating look both back at the aftermath of the hurricane, as well as the ways in which this robust neighborhood is rebuilding and looking to the future. Keeping in the spirit of trying new neighborhoods, head to the Bywater tonight for dinner. This area has experienced massive development in the wake of Hurricane Katrina (it lucked out by being at a high enough elevation to escape the worst of the flooding), and has become a bit of an up-and-coming artists and hipster community. Check out Bacchanal, which bills itself as New Orleans’ backyard party. Enjoy the people watching and the live music in the outdoor courtyard while drinking some wine and enjoying some fantastic low-key food. Enjoy breakfast in or near your hotel/airbnb. Eventually make your way south of the city, out the bayou, and take a swamp or airboat tour. What’s the difference? Swamp tours, held on larger ferry-style flat boats, will be less expensive. They also are usually covered, and often have snack bars for the larger groups. Side note: If you’ve never seen comedian Tiffany Haddish’s explanation of taking Will and Jada Pinkett Smith on a swamp tour while filming Girls Trip, check it out now - it is 10 minutes of pure delight. Airboat tours will be pricier, due to the smaller group and the cost of the boats themselves It’s great fun, though, if you like a little adrenaline rush with your swamp viewing, as they get up to pretty high speeds. While it’s uncovered, the winds will make an airboat tour fairly chilly out on the water - bring something long-sleeved even on warm days. Depending on the time of year, you can expect to see alligators, bald eagles, snakes, cranes, beautiful floating flowers and grasses, and more. In the winter months you’re less likely to see gators as they’ll be hibernating. Even in the spring and fall, don’t take the first tour of the day, and try to avoid going on cloudy days. The cold-blooded alligators need the sun to be out for a few hours before they’ll venture out and about. No worries if you don’t have a car. Most operators will offer pickup and drop off at downtown hotels for an added $20. Once you’re back, rest up. For your last night you’re going to Frenchmen Street. This small neighborhood to the immediate east of the French Quarter used to be where the locals would go to party, leaving Bourbon Street to tourists. The tourists have migrated over a bit, but you’ll find fewer drunk bachelors and more fans of music and dancing. The below places are well known for their jazz and atmosphere. But really, the best way to enjoy Frenchman Street is to walk slowly, possibly with drink in hand, and listen to the music coming out of the different venues. When you hear something catch your ear, head on it! But not with your drink. You’re allowed to take your drink to-go at New Orleans establishments, but you can’t bring in your own booze. Sure, you didn’t go to New Orleans to spend time learning about the battles of World War II. But… you should probably consider it. This museum is the 2nd largest in the country (after Washington DC). It’s massive, comprehensive, with interactive displays, engrossing videos, and beautiful a/v layouts. Each area adds personal stories and is designed to place you in that specific place and time. It’s a little expensive ($28 entry, discounts for students or veterans), but you could easily stay there all day. It’s great for a rainy or muggy afternoon. I passed 4 hours there easily, stopping only for lunch. Sounds boring, right? The history of prescribing and preparing medications? Indeed not! Medicine was an often grisly business in past centuries, and this has the displays to make you grateful you live in a post antibiotic world. If you go, make sure to be there for the 1pm tour. Our tour guide claimed he’s had at least one person faint per week on his tour. Fun fact: Did you know the soda fountain originated at pharmacies? It was done to help patients chase their nasty-tasting medications with a sweet flavored soda. It’s open Tuesday- Sunday with the bargain entry of $5. The low-lying, flood-prone terrain of New Orleans necessitates above ground cemeteries. Beautiful, haunting cemeteries can be seen around the city, but this the oldest and most famous. 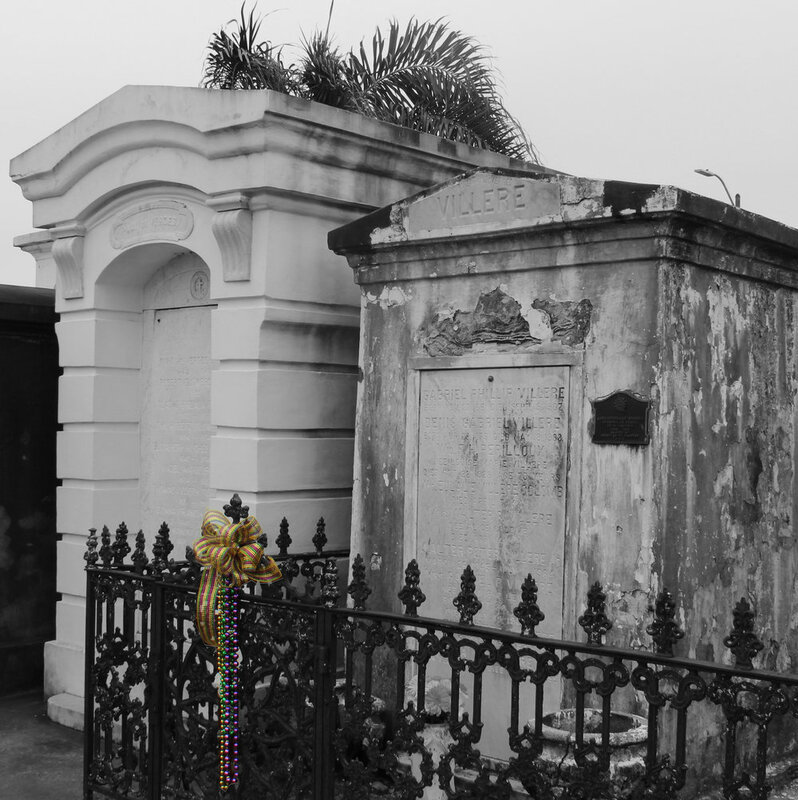 See the final resting places of voodoo priestess Marie Laveau, wealthy French dilettante (and craps popularizer) Bernard de Marigny, as well as the ornate pyramid of actor Nicholas Cage. See where Easy Rider filmed an LSD trip sequence (without the knowledge of the Catholic diocese). Thanks to rising vandalism, the cemetery can only be accessed with a tour guide. Tours are $20 per person. They can be booked in advance, or are available at the entrance. I hope you found this itinerary helpful! To check out more about New Orleans see my overall guide. And pin this itinerary for later!